*View OMC Cobra / OMC parts / in our parts catalog. * Explore our OMC Cobra Sterndrives. 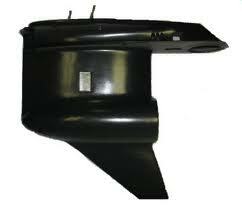 We carry Remanufactured and new stern drives for OMC Cobras from 1986 to 1993. * Purchase OMC Exhaust Manifolds for your OMC Sterndrive engine. If you are looking for an OMC outdrive replacement then this page should be of help to you. Finding a replacement outdrive can be confusing these days. With so many options available in the market, it is difficult to decide what outdrive solution is the best for you. Should you buy a new aftermarket outdrive, a new OEM gear case or a rebuilt one? The choice between cheap prices and inferior parts or quality parts at fair prices is the main consideration. A new aftermarket drive (made in China), in our experience, contains questionable quality makeup of parts that will leave you stranded out on the water in short order. The new OEM gear case is always a great option and should be purchased if it fits your budget. Finally, a quality rebuilt outdrive can be a great alternative if you do your homework and find one that meets the following qualifications. At U.S. Boatworks, we meet all of your needs when you choose our rebuilt outdrive. We remanufacture our gear cases with quality parts and offer a one year warranty on the unit. You will also be pleased with our pricing and our core rebates that save you even more money. Finally most of our units ship out in a day or two so you can get back on the water quickly. You will find helpful, friendly service when you call us. We are happy to answer questions so you feel comfortable with your choice.